How do you get girls interested in STEM (Science, Technology, Engineering and Math) fields? Vega is a Bolivian student at EARTH University in Costa Rica, a leading institution in agricultural sciences and sustainable development. Hazelwood has cultivated connections at EARTH since 2009 and was looking to take the hydroponic vertical agriculture project she started a year ago to the next level. Enter Vega on a semester-long internship. “Karla came with a lot of expertise in what we’re doing. She brought a lot of innovation to what we’re doing in the lab,” Hazelwood said. 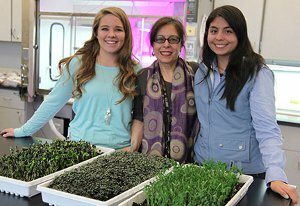 The challenge of the vertical agriculture project bonded Vega, 20, who studies agronomy and natural resources management in Costa Rica, and West, 21, whose science interest was piqued in a high school agriscience program. “That’s what women like, is a challenge,” said West. The challenge will continue next semester, when West will visit Vega at EARTH, joining Hazelwood’s fifth study abroad trip to Costa Rica. “The tables are going to be turned,” said West, who said her Spanish skills are negligible but expressed no concern about immersing herself in the language. Hazelwood, too, has no doubts both students will continue to flourish. She notes that the pair made the greatest gains after the male student who originally supervised the vertical agriculture project left.